Hermit crabs are small crustaceans who don't have hardened abdominal carapaces by nature. To protect their fragile bodies, they squeeze themselves into discarded mollusk shells, exchanging them for larger shells as they grow. They periodically molt their exoskeletons. When they do, they're extremely vulnerable to damage, infections and stress. Not all mites pose a threat to hermit crabs, but those that do require your cautious and patient care. You cannot treat your hermit crab for mites in any way whatsoever while he's in a molt. This is important enough to repeat: Never move or disturb him until he's completely hardened and active -- at least 10 days after you notice he's molting. You can spend the wait time productively by determining whether the mites in his cage are a cause for alarm or simply nuisances. The majority of hermit crab cage mites are nothing to worry about. Harmless food, moss and wood mites are attracted to food and moisture. These detritovores are interested in your pet's rotting bedding, meals and waste, not your crab himself. He'll tend to attract symbiotic predatory mites, both of which may be found crawling around the cage and in food, water and substrate in large numbers. Phoretic mites hitch rides into your crab's tank on your crab, but they don't feed on him -- rather, they steal a share of his food. These may be found loose in the cage, on your crab's body or inside his shells, but they don't usually firmly attach to crabs. Nevertheless, removing them may be more trouble than the effort's worth. Mites who stick to your crab are another matter. These are the little crawlers who run and hide inside his shell or between the joints on his exoskeleton, or that fasten themselves ticklike to his eyes and mouth. You can't get rid of them during his molt, but you can use that time to work out your plan of attack. The most effective and low-maintenance way to eliminate a parasitic mite problem is with predatory mites. They fight your battle for you by eating the mites plaguing your crab and they'll also eat the harmless cage mites. This method may not be completely humane, since they'll eat each other once they run out of food before finally succumbing to starvation. You can purchase parasitic mites from garden supply dealers and specialty reptile and exotic pet suppliers. If you don't want to introduce additional creepy crawlies, you'll have to remove the mites by hand after your crab has hardened up. Put him in a small, clean tank with nothing but paper towels, water and food. Change the paper towels, and clean the entire tank and all dishes with white vinegar every day. Follow with a hot water rinse every single day. Boil unused shells and any tank furniture. 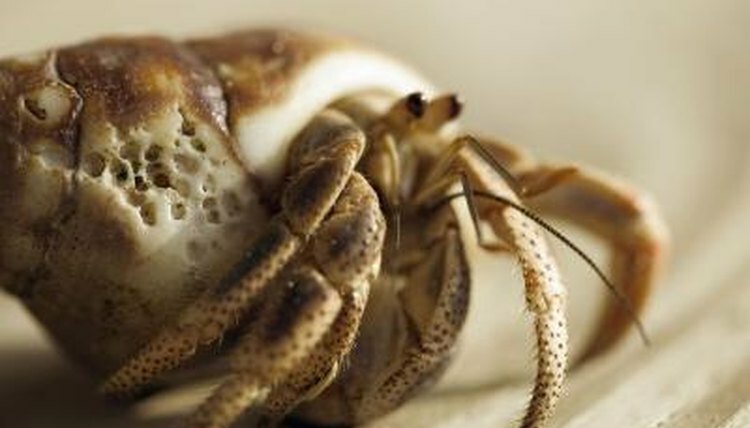 Bathe your crab daily by immersing him for one to two minutes in aquarium saltwater. Continue until you've gone at least three days without seeing any mites.